My name is Cliff Green and I present the Monday evening request show 8.30-10pm and the Saturday afternoon 2-4 slot every other week. 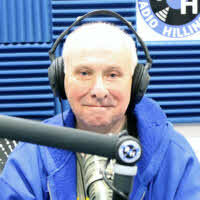 I joined Radio Hillingdon in the 1990s. I was (and still am) Station Manager at Harefield Radio in Harefield Hospital and one day asked if I could look around the Hillingdon studios. The presenter that showed me around, having already sat in on one of my shows at Harefield, asked me to join and so I did. I enjoy the Request shows because I am playing things that people have actually asked for. I enjoy doing all the shows I do, especially on the occasions that I interview people. I like nearly all food, but especially Chinese, fish and chips and I'll have to stop there as I am hungry now and off to get something. What colour do I like, well on it's own...white, but I love Burgandy (the colour) next to grey. During the day I work as an Accountant. I enjoy holidays in Florida, but quite a few others too. I will never win a million as I don't gamble, so I never think about it.